There are many players in this very popular class because many manufacturers work hard to offer the best possible product. Our focus for this match will be the 2018 Hyundai Tucson and the 2018 Mazda CX-5 which will go head-to-head. Their respective base models are offered at similar prices, $24 799 for the 2018 Tucson and $27,8955 for the 2018 CX-5. But maybe we should concentrate on where they differ. The Mazda CX-5 is available in 3 models, the GX from $ 27,895 the GS starting at $31,495 and the GT from $37,095. Whereas the Hyundai offers different models at prices that vary from $ 24 999 for the 2.0 L front-wheel drive option to $ 38 699 for its high-end 1.6T Ultimate version with AWD. However, the Mazda is the only one in Canada to offer an unlimited mileage warranty, standard, on all its new models. That's hard to beat! Standard on the CX-5 is a 7-inch touchscreen, compared to only 5 inches for the Tucson, 6-speed SKYACTIVE-MT manual transmission for those who love sporty driving, not available on the Tucson, and let's not forget that the AJAC (Automobile Journalist Association of Canada) awarded it the prize of the best utility vehicle in Canada, which is saying a lot! The i-ACTIVESENSE safety technologies are standard on all models of the Mazda CX-5, they include the smart brake support, a system to maintain a safe distance from other cars, blind spot monitoring system and rear cross traffic alert, only optional on the Tucson. 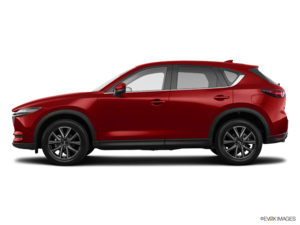 Your Mazda Spinelli dealership in Lachine has several models of the CX-5 in inventory. Come try yours today and you'll fall in love, guaranteed! Furthermore, we offer you many Mazda financing options, including some specifically adapted to your needs and budgets. And don't forget to also ask us about the Mazda promotions, both on new or used vehicles as well as parts and service. If you're near Lachine come see us today!